At night, it’s pitch black, and there is absolutely no sound, except for our own quiet movements. During the daytime hours, there’s an occasional Park Service vehicle that putts past, or the shuffling sounds of footsteps on the gravely roadbed, as other campers wander past. Other than that? Magnificent silence. 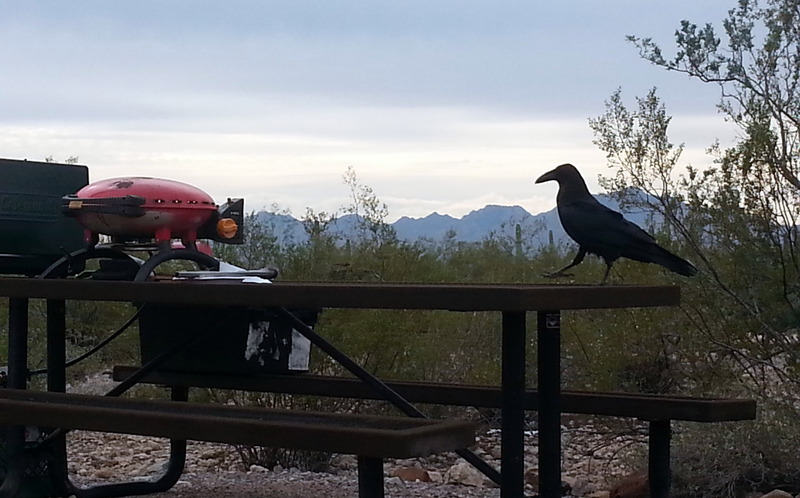 The Twin Peaks Campground at Organ Pipe National Monument inspires grandiose thoughts (of which this blog is a notable exception). We’re in the No Generator section, and there’s not another camper within shouting distance. Oh yeah, we are loving this spot! 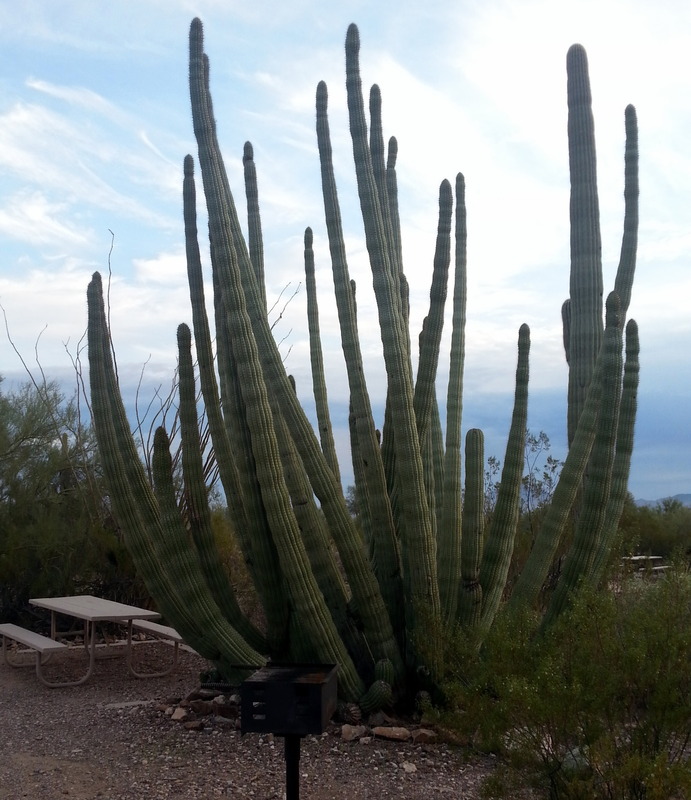 This is an enormous Organ Pipe Cactus. 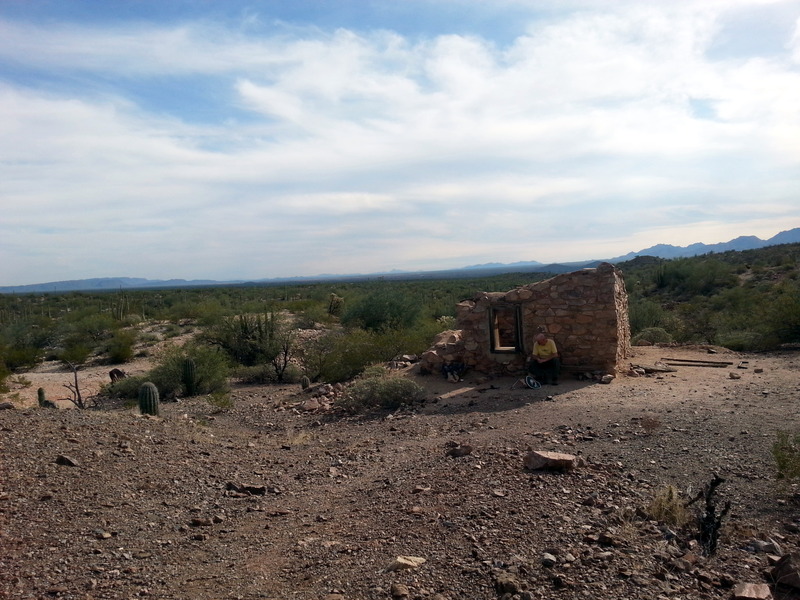 (on site 22, if you care about such things) Here’s another one, out in the Sonoran Desert. We are in the northernmost range where Organ Pipes grow. 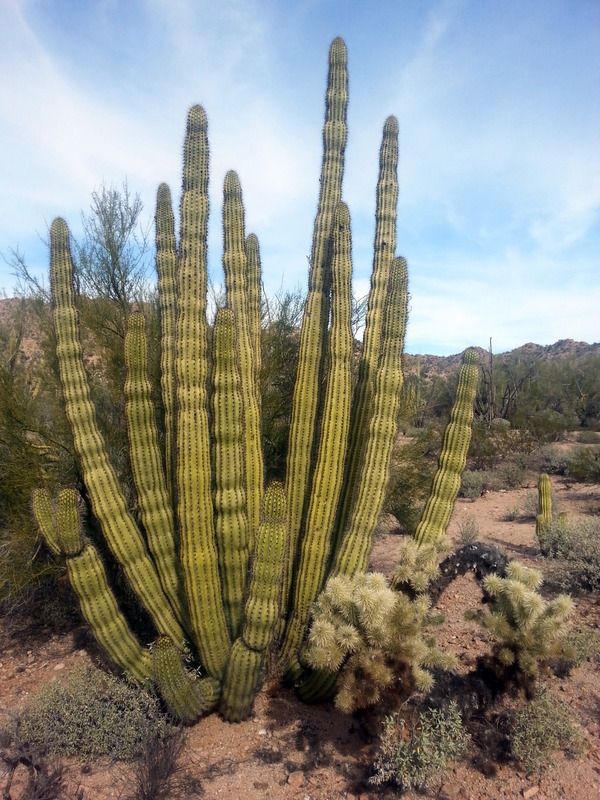 There aren’t as many as we expect – there are lots more Saguaros here. Many of the Organ Pipes look like they don’t have many years left. 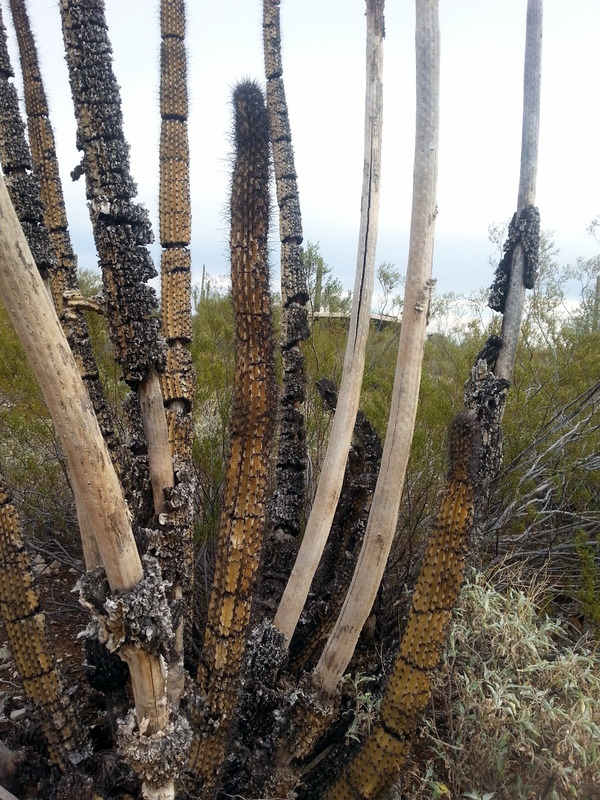 Earlier this year, I posted several photos of crested Saguaro cacti, those which had a genetic twist, or defect that cause a wondrous crest to appear. 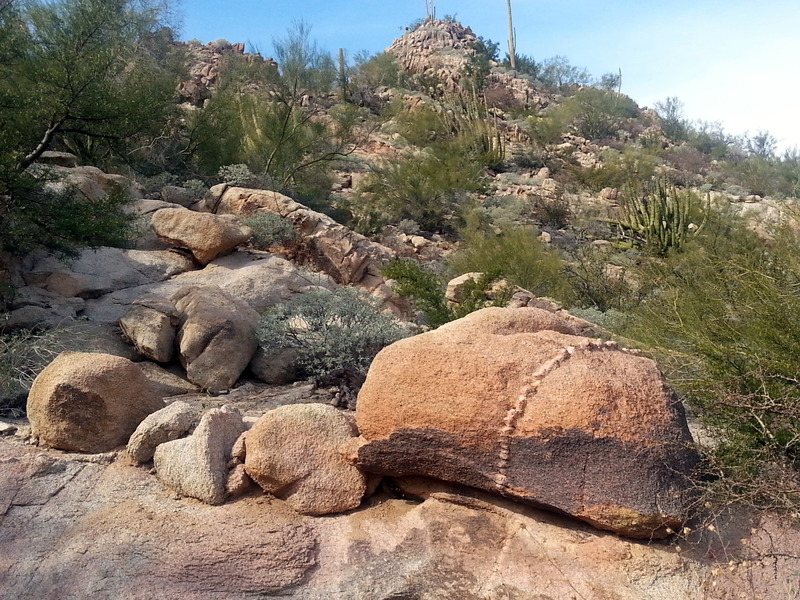 That same trait appears in the Organ Pipe. We saw a spectacular example on our bike ride this afternoon. And yet another, in its final days upright. So, here we are, plopped out in the middle of the desert, just six miles north of the Border. There are very few other campers here. There are a few services – we have flush toilets nearby, and three solar showers (more about that later) in this 207 space campground. It’s immaculate. The Rangers and Volunteers couldn’t be any nicer, or more helpful. 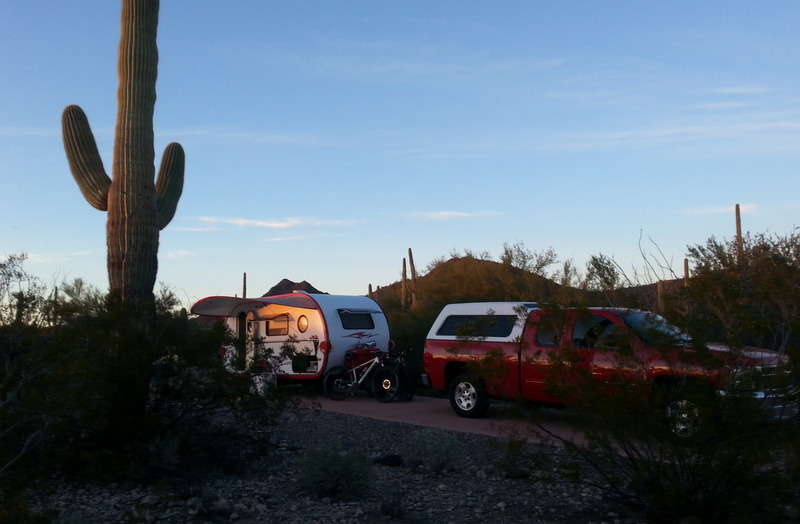 Many of the campers seems to be like us – on the small side – lots of Casitas, Aliners, one T@B, and a few popups. There are about five tents. It’s awesome. A hike seems to be in order for our first full day here. There are several trails, but some of them require driving to a trailhead. After a long day in the Firetruck the day before, it doesn’t take much discussion for us to decide to hike to the Victoria Mine, an abandoned silver mine. Beyond that lies the Lost Cabin Mine. Our round trip will be 7.8 miles, about right – a decent hike, but nothing that we will (probably) regret undertaking. This has been a fantastic camp. 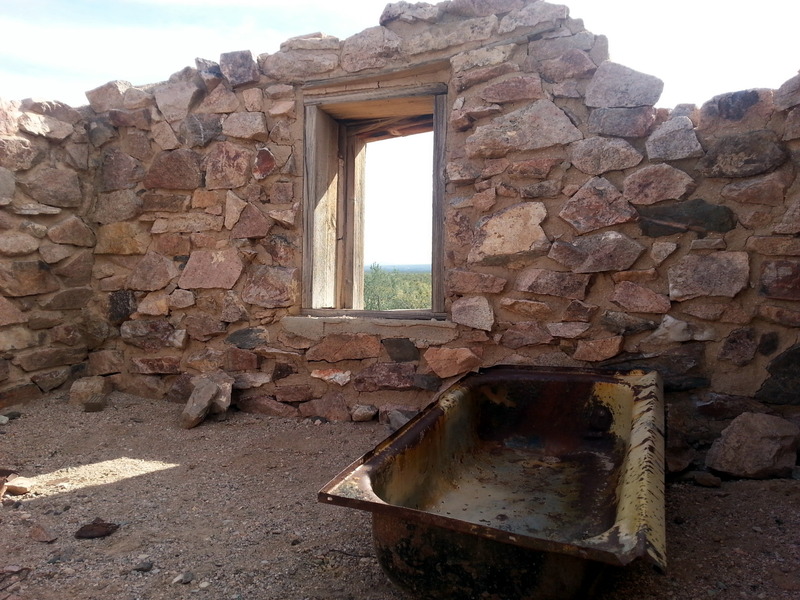 Lightly used, unspoiled, full of history and natural beauty. Our first night here, John spied the Lovejoy Comet – we had a HUGE dark sky full of stars. Amazing. The Ranger program on Day 2 related stories of the constellations – Greek, Roman, and Native American. Sadly, it was an overcast night, and we were forced to imagine the constellations, instead of viewing them from the impressive amphitheater at the campground. 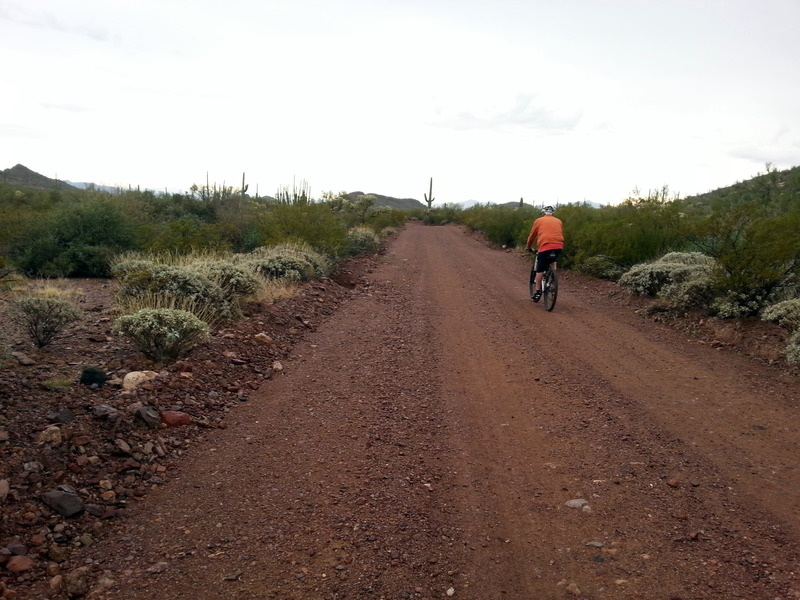 Kudos to the staff here – they work hard to promote Organ Pipe National Monument, which appears to have modest traffic. Speaking of overcast…. a solar shower requires sunshine to heat the water. While we were happy to hike and bike in an overcast sky, it meant a cool shower on Day 2, and a really cold shower on Day 3! Combine Day 3’s water temperature with a amp towel that was left hanging outside in the rain while we were cycling…..no, wipe that image from your mind – bad, BAD visual! This would have been a good time to use the Fireball’s shower, for sure. If I had known how cold the water would actually be…..We only have towel each – it’s a SMALL camper! There are pluses and minuses. 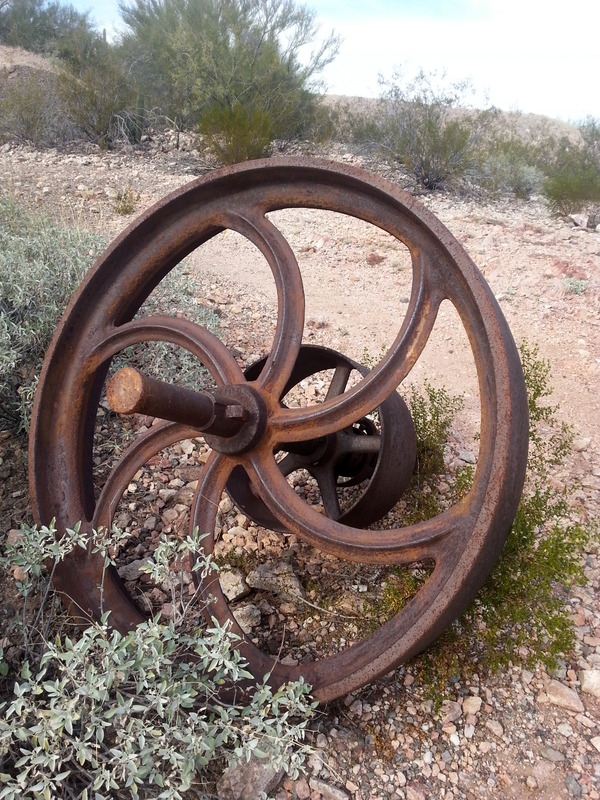 This entry was posted in Arizona, cycling, hiking, national parks, retirement, simple camping, T@DA and tagged Arizona, cycling, hiking, historic sites, national parks, Organ Pipe National Monument, retirement, road trip, simple camping, T@DA, the great outdoors by Judy Crankshaw. Bookmark the permalink. You two are amazing in the way you seem to be able to get more than your money’s worth out of every camping experience and for the way that you are able to pass it on to those of us enjoying your trip from afar. Thanks, Dave. The way I see it, I can write one blog post, or send 100 postcards. This is like having a bunch of pen pals! Happy New Year to you and Sheila. Your post hits all the reasons that I love to camp out away from it all, the peace and quiet, the wonder of a starry night, and the natural beauty of the world around us if we take the time to see it. You obviously have! And we even had a few rogue birds for you, Jerry. We are moving to a National Wildlife Preserve today. Should be interesting. Thanks, Jochen. Good to have you along for the ride. Looks beautiful. 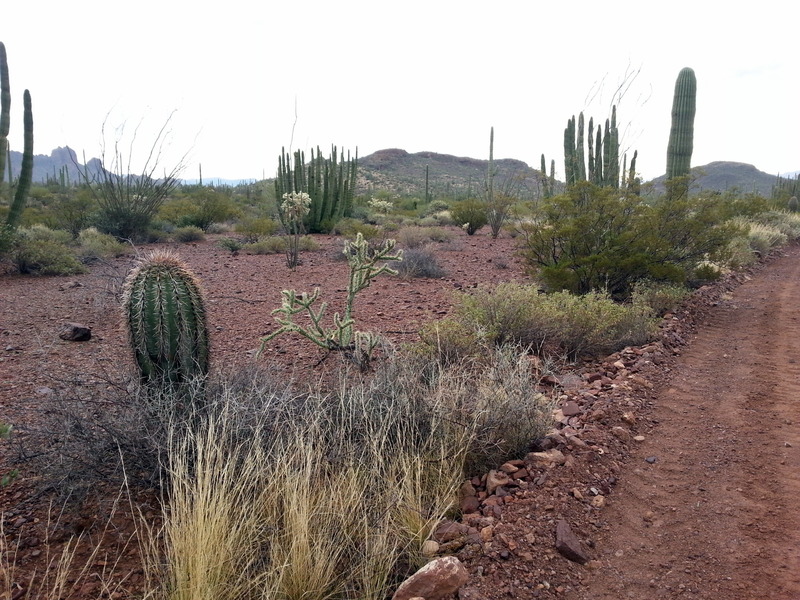 It’s been years since I’ve seen the Sonoran desert and would love to go back. Maybe in a couple of years! Happy trails! Why don’t you persuade Chuck to retire, or at least take an extended winter vacation? It would be fun to roll with you for awhile. Book Club every night over a campfire! The stars must be absolutely breath..taking. I was through that area when I was 16…still vivid memories. Jezzy’s bone?!!! Bad raven!!!! Jezzy is willing to share, but she sure is giving that bone a wary eye now. Much be all sorts of interesting scents there! This is a gorgeous area – we are already planning our next trip. There’s lots of good hiking being left unhiked! Wonderful post, as always, Campshaws!!! Love those photos (especially the discarded hiking boots!) 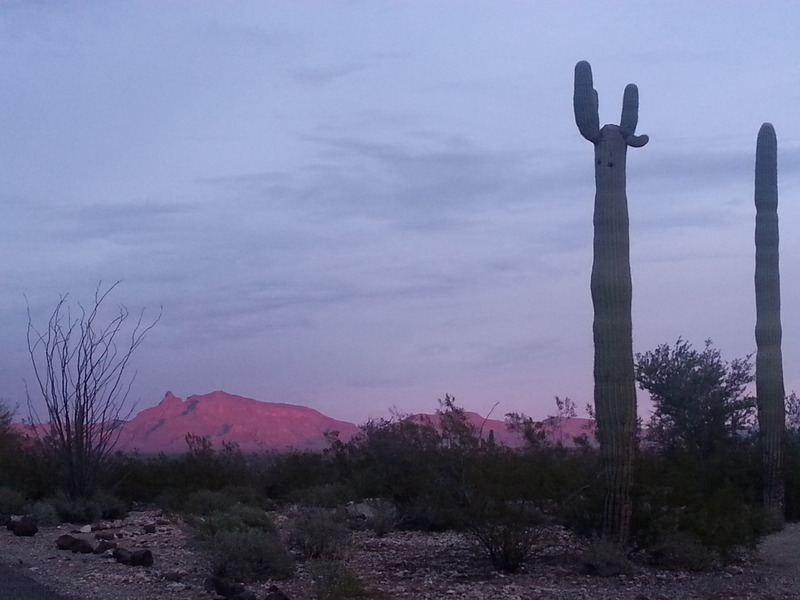 The cacti are spectacular and Fireball looks very happy nestled between them in the sunset! Did you ever get your fridge situation settled? Looking forward to the next Campshaw adventure. Thanks, Susan. 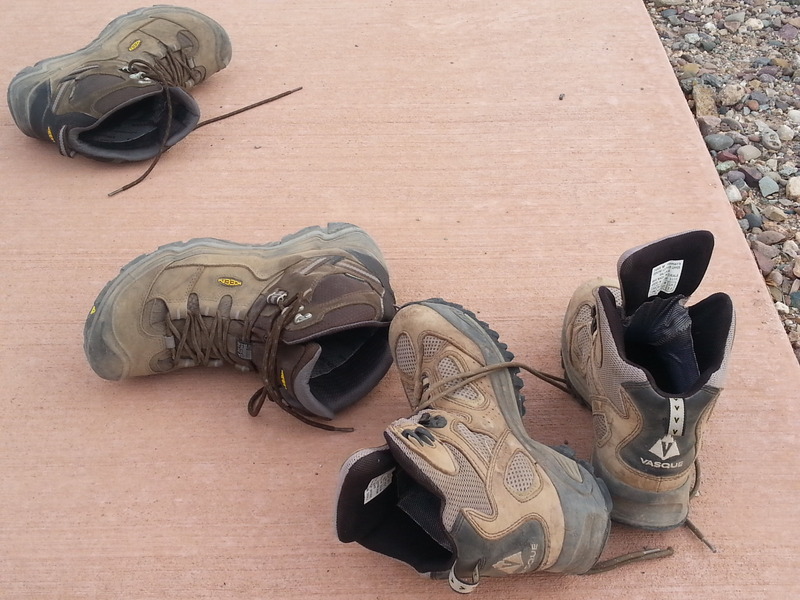 One of the best parts of a hike is always taking your boots off. No resolution on fridge yet. We will order one when we get to Green Valley next month. Nobody stocks them, and we’ve got no shipping address for now. So, we’re using our fridge as an icebox….keeping ice in a plastic container in the freezer compartment. We always carry a big cooler as well. Bad thing is that we are miles away from an ice source here…..that’s the reason why we’re moving on today. Load up with ice, and boondock for the next three days! That kind of silent night, we sure don’t need. But, aren’t you glad to get a bit of snow again? The scenery is amazing to me. The way you write makes me feel like I am experiencing it right along with you. Especially love the photos of the crested cacti. Thanks, Sharon. 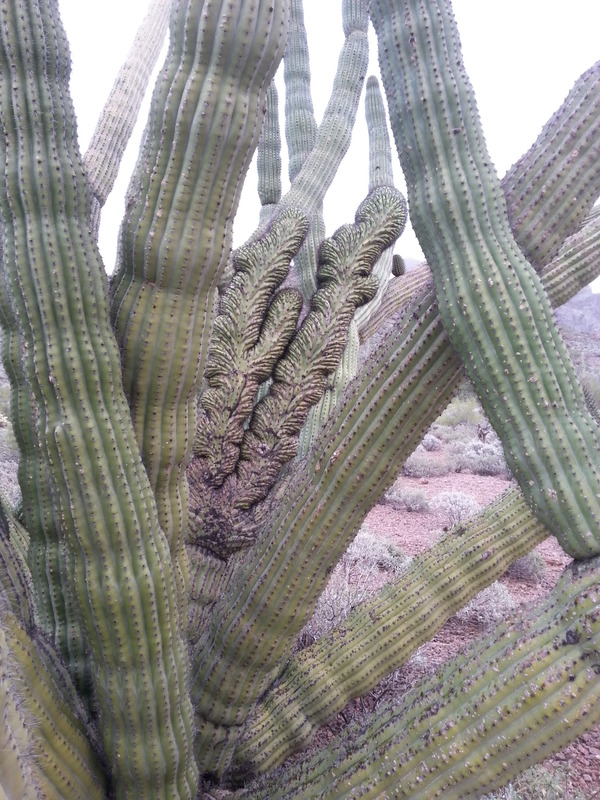 The cacti here are so un-Michigan. Eye-candy for northern eyes. Once again you’ve captured the spirit and essence of the environment in your narrative quite nicely. I too love the desert and spent years wandering about it many years ago in my early twenties. 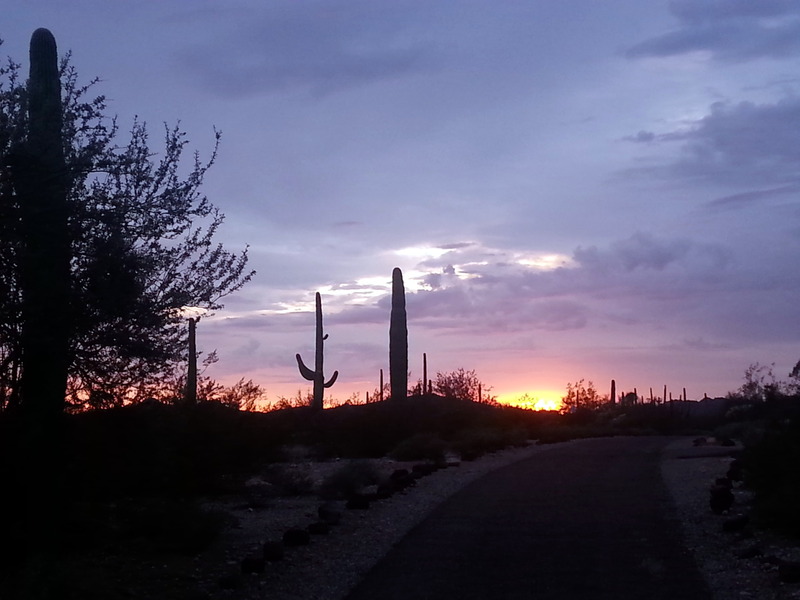 There’s something metaphysical and meditative about walking in the desert. I never went hiking but I could walk for 6 miles or so before realizing it. I’ll add this to our list of places we haven’t been to yet :-) Looking forward to your next installment. We are indeed happy to be missing the snow and cold at home, although I was disappointed that we didn’t get snow in December while we were there. The longer you camp, the better it gets. We’re hoping to beat last year’s 179 nights in the Fireball, too. I love our home and community in Michigan, but am happy to be out exploring for the time being.